Over the years, we’ve noticed a few trends in home/property improvement, one of which is split rail fencing. This is a type of wood fencing that was very popular in the olden times. In fact, it could be one of the oldest types of fences. You see, during the Civil War, soldiers needed a portable yet durable way to protect themselves and create barriers. Often times there just wasn’t enough room to carry bulky fences with them. They eventually turned to their surroundings to help protect them by cutting down and splitting trees. 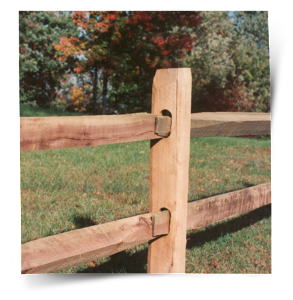 This is how the name “split rail” came to be and you can see one of the most popular designs above. Eventually, as homes became more modern and new fence material was created (such as vinyl/PVC), split rail fence installation dwindled. However, as homeowners are looking to spruce up their property on a budget, they are turning to older, more classic looks. Thus, the resurgence of the split rail fence. As we mentioned before, split rail fencing is cheaper to install than some of the other fencing products out there but it requires detailed planning. When installing this type of fence, we have to account for various different elements – slope, angle, etc. Our motto is measure twice, install once. With this type of fence installation, you want to make sure that you go with a fence contractor that has the skills and experience necessary. Here at Anello Fence, we pride ourselves on being one of the oldest fencing companies in NJ. Our craftsmen are masters at designing and installing fences. If you’re interested in having us install your next fence, you can schedule your complimentary estimate by clicking here.